There were 737 press releases posted in the last 24 hours and 153,510 in the last 365 days. LONDON, GREATER LONDON, UK, November 8, 2018 /EINPresswire.com/ -- The value of the biopharmaceutical logistics moved by air by the logistics companies that move drugs, vaccines, blood plasma products and so on around the world will be 6% lower in 2021 than they were in 2013, Biopharmaceutical Logistics Global Market Opportunities and Strategies To 2021, a new report from The Business Research Company shows. Air transport revenues in this market are shrinking despite the overall market for outsourced biopharma logistics growing by 37% over those eight years. 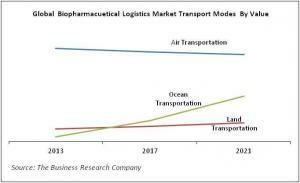 Earlier biopharmaceutical logistics companies made the most use of air transportation: in 2013, 84% of all outsourced biopharmaceutical products were moved by air. By 2017, that proportion had dropped to 71% and by 2021 will fall to only 58%.